A mixture of herbs, either fresh or dried, that are placed into savory foods as they cook to enhance flavor. A bouquet garni may be made from either fresh ingredients tied together or dried ingredients mixed and placed in cheesecloth tied into a bag for dipping into soups, stews, sauces, casseroles, or meat dishes. Fresh ingredients are tied together with a long piece of string. 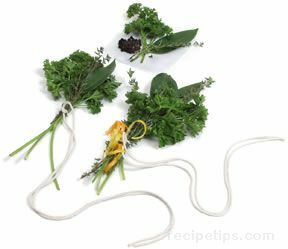 A 6 to 12 inch strand should extend from the knot so that the bouquet garni can be easily placed into and removed from a steaming pot. A classic bouquet garni is made with 3 sprigs of parsley, 1 small sprig of thyme, and 1 small bay leaf. For a flavorful twist, lemon and orange zest can also be added. 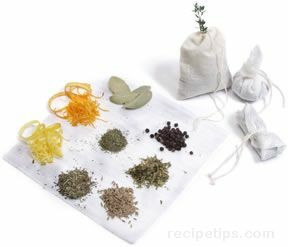 When mixing fresh and dried herbs together, it is best to wrap them securely in cheesecloth. When dried ingredients are used, make a bag with a square piece of cheesecloth material that is tied with a long piece of kitchen twine. Pre-made bags, that are available at grocery and specialty stores, can also be used to easily form a holder for the ingredients. The proportion of the different herbs in your bouquet must be balanced. If you combine equal parts of robust and mild herbs, the robust will mask the mild. Manufactured garni bags are available in grocery and specialty stores. Similar to tea bags, they contain pre-selected herbal ingredients and are sealed in paper steeping bags. Bouquet garni can be made ahead and frozen once you have placed them in cheese cloth bags. Leave the twine long so you can attach it to the pot handle, this will make the bouquet garni easier to retrieve. Dental floss may be used when kitchen twine is not available, but make sure it is unwaxed and unflavored.